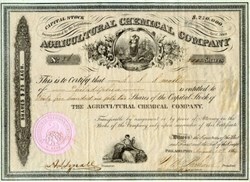 Beautiful certificate from the Agricultural Chemical Company issued in 1864. This historic document has an ornate border around it with a vignette of an allegorical woman and state seal. This item has the signatures of the Company's President, William M. Parham and Secretary, Able S. small and is over 151 years old. To incorporate the Agricultural Chemical Company. Samoa 1. Be a'tenacted by the Senate and House of Representatives of the Commonwealth of Pennsylvania in General Assembly met, and it is hereby enacted by the authority of the same, That R. B. Fitts, Abel S. Small, John W. Thackara, William M. Parham, John S. Thackara, George P. Fitts, John Schafer, Arthur Hughes, William Faunce, Theo. M. Apple, Lewis Eckel, and their successors, and all persons who are, or who may hereafter be, associated with them, be and they are hereby created, and erected into, a body politic, and corporate, indeed, and in law, by the name, style, and title, of the Agricul- Title, tural Chemical Company, and by that name, shall have perpetual succession; and shall be able to sue, and be sued, to Privilegns. plead, and be impleaded, in all the courts of record, and elsewhere, and shall be capable, in law, and in equity, to receive, take, and hold, by purchase, gift, demise, or bequest, for the use of the said corporation, lands, tenements, hereditaments, and estates, both real, and personal, wherever situated : Prom'ded, That the said corporation shall not hold, by purchase, Proviso. real estate of a greater yearly value than ten thousand dollars, and the same to grant, bargain, sell, and assign, in fee simple,or for any less estate, as to the said corporation, may seem proper; and to make, and have, a common seal, and the same to Seal. break, alter, and renew, at pleasure; and, also, to ordain, and establish, and put into execution, such by-laws, and regula- By-laws. tions, as shall appear necessary, and convenient, for the g0- vernment of the said corporation, not being contrary to the constitution, or laws of the United States, and of the common- wealth of Pennsylvania, and generally, to do all, and singular, the matters, and things, lawfully appertaining to the well be- ing of the said corporation, and the due management of the affairs thereof. The capital stock of the said company shall consist of ten thousand shares, of twenty-five dollars each, to be called inwas the necessities of the said corporation may require, for the purpose of carrying on the general business operations of the said corporation. The government of the said corporation, and the Management management and disposition of its affairs, and property, shall be vested in a board of seven directors, who shall be elected Election of di. by the stockholders, annually, at such times, and in such man- rectorsner, as the by-laws of the said corporation shall direct : Provided, That said corporation shall not purchase, or hold, any Prohibition, real estate, except such as may be requisite, and neccsary, to carry out the true intent, and purposes of this act. HENRY C. JOHNSON, Speaker of the House of Representatives. JOHN P. PENNEY, Speaker of the Senate. We do certify, that the bill, No. 219, entitled � An Act to incorporate the Agricultural Chemical Company,� was presented to the governor on the eleventh day of March, one thousand eight hundred and sixty-four, and was not returned, within ten days (Sundays excepted) after it had been presented to him; wherefore, it has, agreeably to the constitution of this commonwealth, become a law, in like manner as if he had signed it.